Caught in the flurry of the evolving insurance market, broker Filhet-Allard faced an ever-encroaching challenge: to shorten IT deployment lead times to remain ahead. They’d mostly done so, redesigning their management tools using the Cleva ERP system, but Filhet-Allard still needed to deploy the ERP quickly, so that the business could use it as soon as possible. 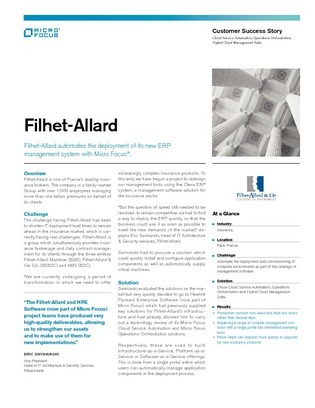 In order to quickly deploy the complete ERP Cleva environment, install and configure app components faster, and automatically supply virtual machines, Filhet-Allard chose an IT systems’ management suite that integrates cloud service automation, operations orchestration, and hybrid cloud management. Read on to see their results.